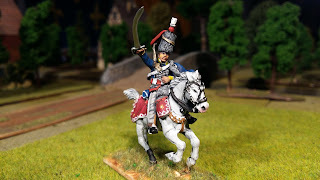 I have been looking for a senior officer to command my British Light Cavalry Brigade in the Peninsular and I have found some very interesting details about Lieutenant Colonel Sir George Augustus Quentin of the 10th Hussars The Prince of Wales’ Own. 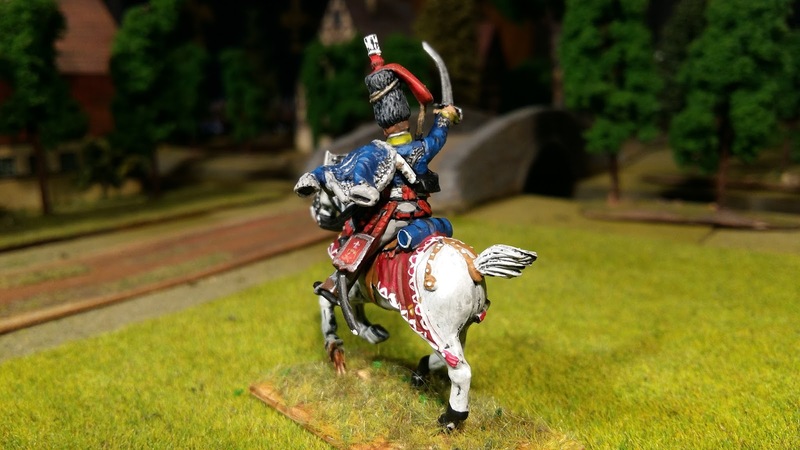 As I am fielding the 10th Hussars, as well as a couple of smaller Light Dragoon regiments, this chap seems the perfect candidate. George Quentin was born in 1760, and was the eldest son of George Quentin of Göttingen. Quentin served seven years in the Hanoverian Garde du Corps, prior to entering the British Army. 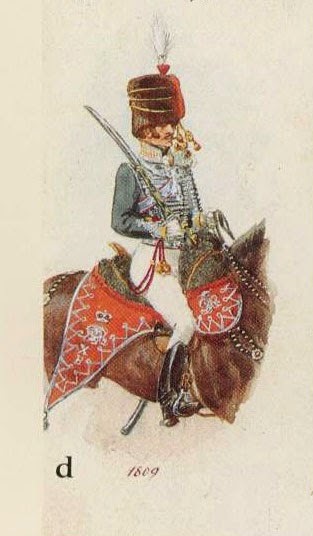 He was appointed cornet in the 10th Light Dragoons in 1793. Subsequent promotions followed to lieutenant (1 October 1794); captain (17 May 1796); major (14 February 1805) and Lieutenant-Colonel on 13 October 1808. 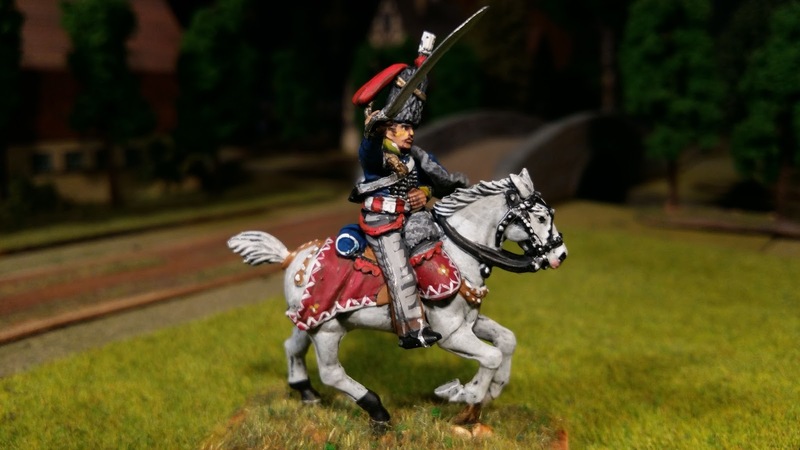 He served in the Peninsular War under Sir John Moore from 11 November 1808 to 16 June 1809, at the battles of Benavente and Corunna; also in Spain, under the Duke of Wellington, in 1813 and 1814, where he received a gold medal and one clasp for his conduct in command of the 10th Hussars at the battles of Orthes and the Toulouse. He received the brevet rank of Colonel on 4 June 1814. On 17 October 1814, Quentin was court-martialed on multiple counts of dereliction of duty during the Peninsular War. At the trial it became apparent that the charges had been invented by the officers of his regiment in retaliation for Quentin's attempt to impose discipline on the "aristocratic rabble" under his command. The trial lasted two weeks at the end of which the court decided that Quentin should "be reprimanded in such manner as his Royal Highness the Commander in Chief shall be pleased to direct." This ‘reprimand’ does not appear to have affected his military careeer as in 1815 he served under Wellington in Flanders, and at Waterloo, where he was severely wounded. He was promoted to lieutenant-general in 1838. Quinten was created a Companion of the Order of the Bath (C.B.) in 1815 and Knight Bachelor in 1821. 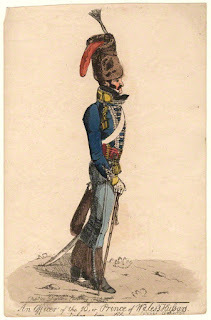 He was aide-de-camp to the Prince Regent from 1811 to 1825, when he was appointed Equerry to the Crown Stables. He died on 7 December 1851 aged 91. 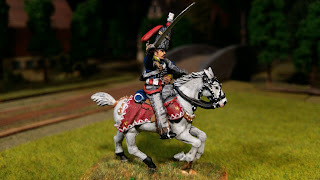 So my Light Cavalry Brigade commander is a (probably highly efficient) German (brought up in Hanover he might have spoken English with a German accent) who is an aide-de-camp to the Prince Regent (so politically he has influence and protection) and who is disliked by the aristocratic officers (fops?) of the regiment he commands. That brings on some possibilities. I am considering representing (generically) Sir David Baird’s reinforcements to Sir John Moore’s army as the basis for my British Army. I will drop the British Guards but think that two British divisions with artillery and cavalry will make a fine force. An extremely handsome figure that looks much larger than 28mm. Well done! Excellent - an interesting biography!